During one of our recent workshops, a woman banker had just delivered a wonderfully engaging presentation about a program she was passionate about. During the presentation, she smiled. She moved around the room. She spoke with excitement in her voice and in her face. We often find that some people are able to improve their presentation skills dramatically with only a little coaching. But that doesn’t mean that they’re going to be great presenters. They have to have the courage to stand out and be great in front of their peers. Most corporate environments do not seem to encourage great presenting. If you look around at the other presenters, you will see that most people deliver boring presentations that fail to tell stories, are unfocused, have too many slides, and are delivered with all the passion of a house-plant. If you choose to be good, you’re going to stand out from your peers. And that can be scary. Give her points for honesty. 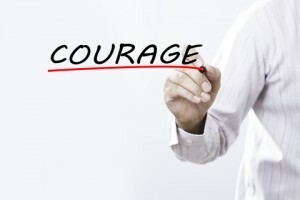 Ultimately, the key to screwing up your courage comes with preparation. If you have worked hard in rehearsal and know that you’re ready, it’s a lot easier to stand up and deliver with passion. But, ultimately, all the practice in the world can’t increase your daring. You have to be willing to take the risk that you’re going to stand out from the crowd. Being a great speaker takes courage.